The Romanesque style building of the Driskill Hotel with its stained-glass dome, marble floors and columned lobbies speak of classic elegance and opulence is among the world’s most luxurious hotels. Stepping into it is like stepping back in time. It also has a reputation of being one of the most haunted hotels in Texas and arguably the whole of North America. You might just have a ghostly encounter with Col. Driskill himself. Room 525 is rumoured to be the most haunted room in the entire hotel. It is believed that two young women who were in the hotel for their honeymoon committed suicide in the room twenty years apart from each other. For a short period of time, the room was shut close. The room was opened again during the renovation in 1998 and since then strange occurrences have been reported. Some of the reported phenomena include ghostly apparitions, unexplained leaks, sensations, distant voices and unexplained noises. The hotel’s fourth floor is also the home of a woman who committed suicide. The spirit of a female has been seen in the fourth floor. The hotel staff has also reported a woman crying on the fourth floor even when there is no one there. Lastly, there is a documented story of a young girl, who was the daughter of a Senator, met her fate while playing with her ball on the grand staircase. 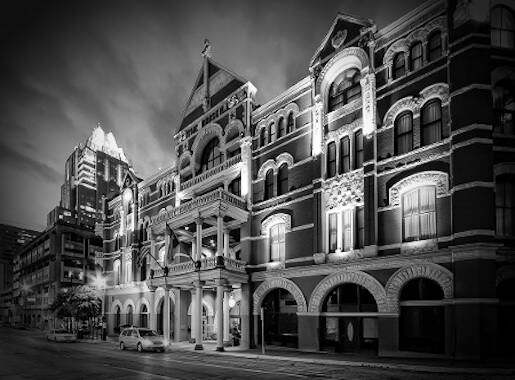 The Driskill hotel was the brainchild of Col. Jesse Driskill. The hotel just cost $400,000 to complete. It originally had four stories and it occupied almost half a block. It had three archways, one on the north, south and another on the east. Six million bricks were used in the building’s construction. The architectural firm of Jasper N. Preston & Son helped design the building. Carved limestone busts of Col. Driskill and his two sons, can be seen crowning the hotel in three sides. The hotel’s grand opening was on the 20th of December 1886. It was even featured on the special edition of the Austin Daily Statesman. Then governor, Sul Ross, chose to have his inaugural ball in the hotel’s ballroom and since them it has become a Texan tradition. Through the 19th and 20th century, the hotel changed several hands. In 1930, the hotel’s original building was expanded by Trost & Trost. The hotel has been listed on the National Register of Historic Places in November 25, 1969. The most recent renovation was back in 1996. The Driskill Hotel is the landmark of Texan hospitality. Located in downtown Austin, the luxurious, elegant and classic hotel has all the glamour of the past with the convenience of the present. The hotel has 189 suites and guestrooms and it is a member of The Historic Hotels of America and it is among the world’s finest hotels. With 18,080 square feet of flexible meeting space and facilities, it is an ideal place for meetings, exhibits and weddings. The hotel has even been voted as The Knot Best of Weddings 2011/2012. The professionally trained staff can help personalize your wedding menu, select cakes and reserve your guestrooms. The Driskill Grill is an award-winning restaurant where you can relax, have fun and eat good food. The best wines are also served during meals while you enjoy your food with The Greyhounds playing live in the background. When staying in the Driskill Hotel, the 1886 Café & Bakery should not be missed. The café is located at the busy corner of Brazo and Sixth Streets. It is a gathering place for locals and out-of-town guests who are looking for regional American foods which come with contemporary fair. The café has the finest Austin pies, cakes and pastries. Austin is known as the live music capital of the world and it would be travesty not to visit Austin Music Hall when in town. The Austin Music Hall has hosted various musical events for a good number of years. Antone’s Nightclub, founded by Clifford Antone, has helped launch the careers of various musicians. Long Center for the Performing Arts has also hosted a lot of musical acts. If you love music and the arts, you should definitely visit this place. You might just be in for one musical spectacle. There is always something in Austin which will pique your interests.